FSTOP123 - Outstanding Stock Photography - Aging with Attitude! One of our recent shoots took us to an outdoor cafe where we met up with a fun group of senior adults who did not "act their age". 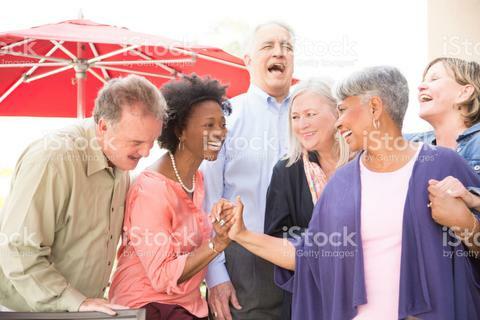 This lively bunch is definitely "aging with attitude" as they enjoyed each other's company. We captured the group of friends outdoors as they shared coffee, laughter, and also a group shopping trip. To view the images and videos from this shoot as well as all of our active "SENIOR ADULT" images, click the link below. To view or download the image above, just give it a click!